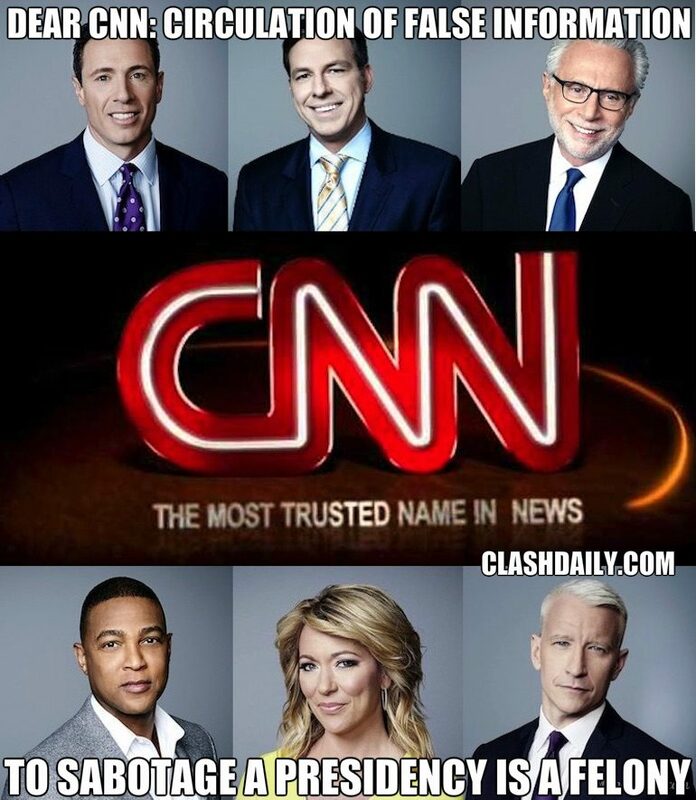 The massive amount of negative coverage on President Trump just about everywhere is shocking, but it’s most apparent on CNN where more than 90 percent of their coverage is to cast the President in a negative light. 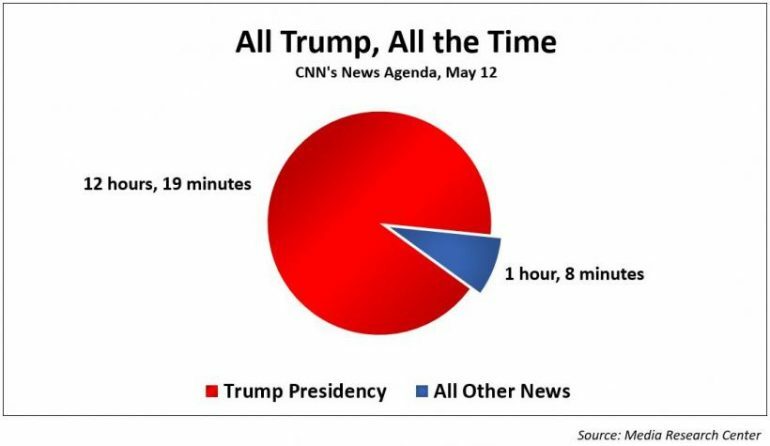 MRC did a study of 20 hours of CNN coverage to see what a typical day looks like. CNN claims it’s right down the middle, somewhere between the left-wing MSNBC and the more conservative-friendly Fox News Channel. 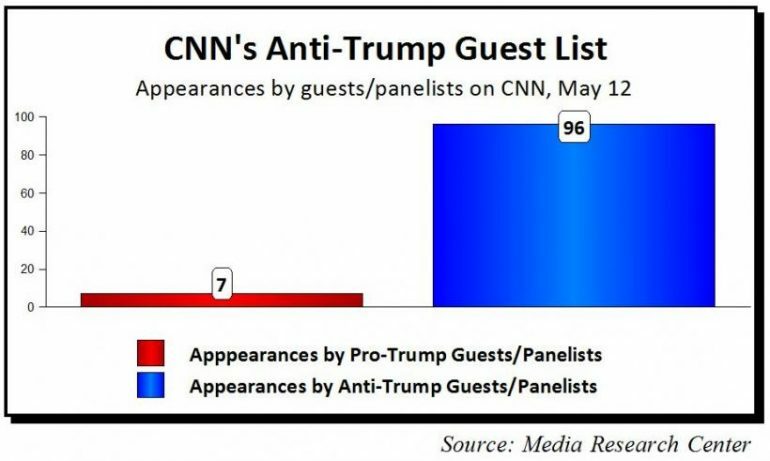 But an MRC study of an entire day of CNN’s coverage shows the network spent almost all of its time covering the Trump presidency, with a heavily skewed roster of anti-Trump guests and on-air commentators. To get a handle on CNN’s news priorities during the Trump era, a team of MRC analysts reviewed all of the cable network’s programming on Friday, May 12, starting with the 4am ET Early Start and continuing through the 11pm ET CNN Tonight with Don Lemon, a total of 20 hours of material. It tilted Anti-Trump and Left. Looking just at CNN’s own on-air talent, the results were even more tilted, with 69 appearances by anti-Trump analysts, vs. just two for pro-Trump analysts — CNN political commentator Paris Dennard, who appeared during the latter half of the 3:00pm ET hour, and CNN political commentator Jason Miller, a former Trump campaign aide, who appeared in the 8pm ET hour of Anderson Cooper 360. CNN counter-terrorism analyst Phil Mudd, for example, harshly condemned the President during appearances in the 6am, 8am, 11am, 5pm, 8pm, and 9pm ET hours. “Give the President of the United States a pacifier and a rattle and put him in the crib,” Mudd declared during his 11am ET appearance. But what if all their coverage of the ‘anonymous leaks’ that have no basis in reality — as evidenced by the flat denials of anyone present — is sabotaging the Presidency? Would they be accountable for that? According to the law, yes. (C) if death results, be fined under this title or imprisoned for any number of years up to life, or both. (C) if death results, shall be fined under this title, imprisoned for any number of years or for life, or both. Whoever engages in any conduct with intent to convey false or misleading information under circumstances where such information may reasonably be believed and where such information indicates that an activity has taken, is taking, or will take place that would constitute a violation of chapter 2, 10, 11B, 39, 40, 44, 111, or 113B of this title, section 236 of the Atomic Energy Act of 1954 (42 U.S.C. 2284), or section 46502, the second sentence of section 46504, section 46505 (b)(3) or (c), section 46506 if homicide or attempted homicide is involved, or section 60123(b) of title 49 is liable in a civil action to any party incurring expenses incident to any emergency or investigative response to that conduct, for those expenses. The court, in imposing a sentence on a defendant who has been convicted of an offense under subsection (a), shall order the defendant to reimburse any state or local government, or private not-for-profit organization that provides fire or rescue service incurring expenses incident to any emergency or investigative response to that conduct, for those expenses. A person ordered to make reimbursement under this subsection shall be jointly and severally liable for such expenses with each other person, if any, who is ordered to make reimbursement under this subsection for the same expenses. An order of reimbursement under this subsection shall, for the purposes of enforcement, be treated as a civil judgment. This section does not prohibit any lawfully authorized investigative, protective, or intelligence activity of a law enforcement agency of the United States, a State, or political subdivision of a State, or of an intelligence agency of the United States. He says there that he hadn’t been told to stop an investigation. Now, either the ‘notes’ he took are false and put out by a disgruntled former employee, or he lied to Congress under oath and committed perjury. Either way, why isn’t CNN questioning that?